Ravens are crafty! 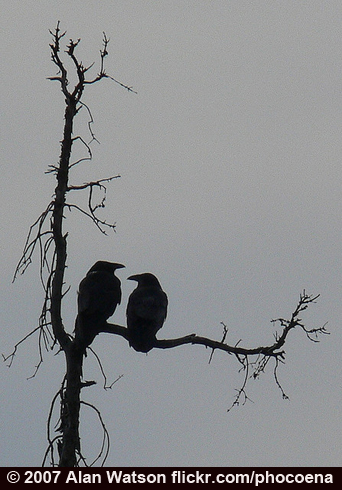 BirdNote listener Gary Cummins tells a story about the intelligence of ravens. When he worked at Grand Canyon National Park, Gary had a Siberian husky named Tasha. When two ravens saw her with a tasty bone, they teamed up on her. One raven acted distressed, hopping slowly, seemingly ignoring the dog. Tasha went into her wolf-like mode, stalking the raven. Just as Tasha was ready to pounce, the raven flew up into a tree. 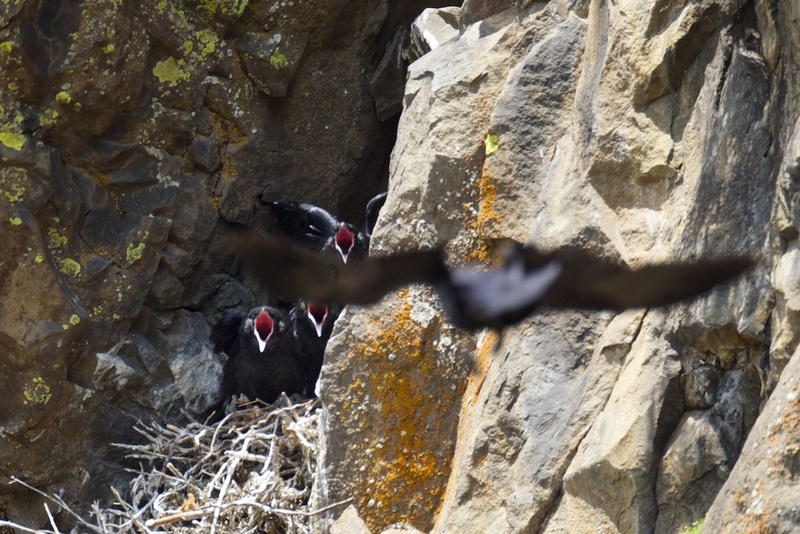 At that instant, the second raven swooped in, grabbed the bone in its beak, and flew off! Many consider ravens among the most intelligent of birds. A story told by BirdNote listener, Gary Cummins, gives us further reason to believe. One raven landed in the yard, well away from Tasha and the bone. It acted distressed or injured, hopping slowly and seemingly ignoring the dog. [Common Raven calls] Tasha, seeing the distressed raven, went into her wolf-like stalking mode, creeping up on the raven while staying low to the ground. Thanks, Gary! Good story! For BirdNote, I’m Mary McCann. Calls of Ravens provided by The Macaulay Library of Natural Sounds at the Cornell Lab of Ornithology, Ithaca, New York, 105705 recorded by G.A. Keller; 132161 recorded by G. Vyn; chortling recorded by G.A. Keller.